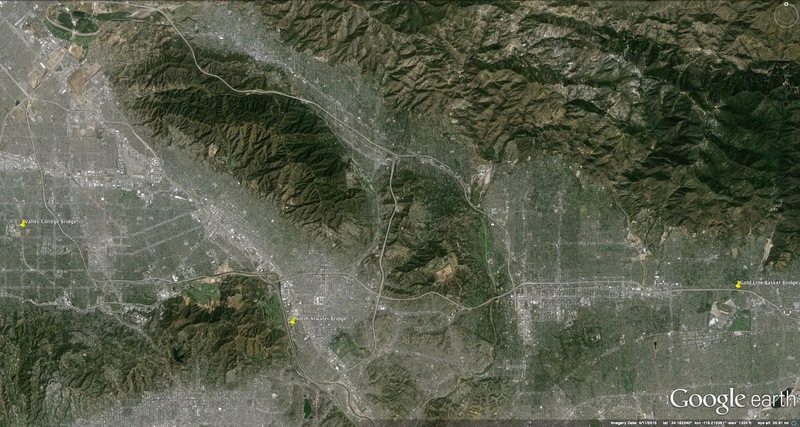 I thought I'd discuss some interesting new bridges that were recently built (or soon to be built) in the Los Angeles Area. The GoldLine Bridge (53 3068) shown above was built in 2012 and carries LA Metro tracks across State Route 210 in the City of Arcadia. 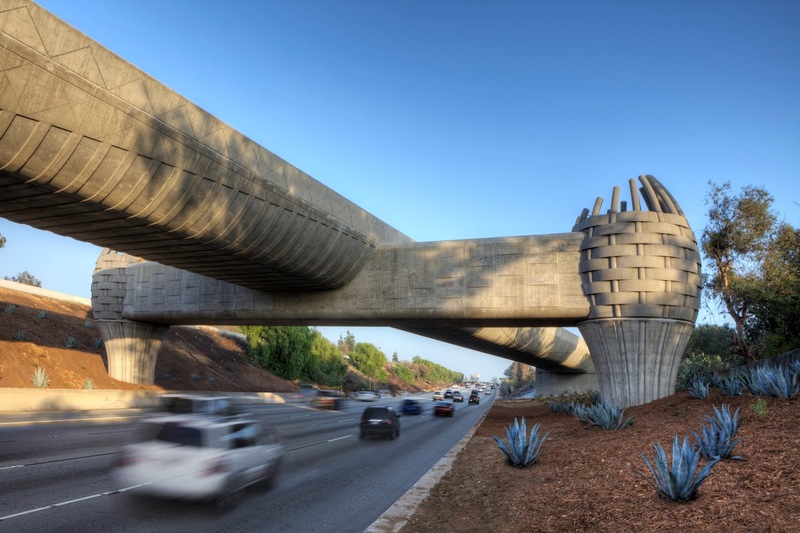 The bridge cost $18.6 million and was designed by the artist Andrew Leicester. He said he wanted to pay homage to the past by designing the outrigger bent to look like two Native American woven baskets. Beneath the decorations is a prestressed concrete box girder bridge. 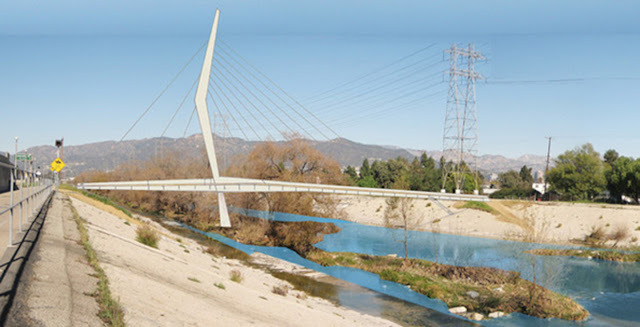 About 13 miles east of the GoldLine Bridge is the Los Angeles River beside Griffith Park, which is the site for the future North Atwater Park Equestrian Bridge. 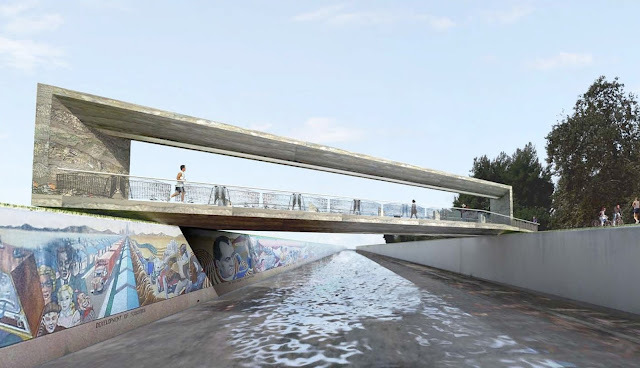 It will be a 302 ft long cable stayed bridge designed by Buro Happold, along with Fuscoe Engineering, Leighton Engineering, construction consultants Gardiner and Assoc., and landscape architects Mia Lehrer (with Tetra Tech). The tower will be over 200 ft tall to remind drivers on the nearby I-5 Expressway that the river (with its many recreational possibilities) is nearby. Continuing east of the North Atwater Park Bridge is the Great Wall of Los Angeles, which shows the history of the area. Above the wall will be built the Green (Valley College) Pedestrian Bridge across Tujunga Wash that replaces a previous bridge at this site (that was removed last year). The new bridge is designed by Judy Baca, the Social and Public Art Research Center (SPARC), and wHY Architects. The bridge will be built out of recycled material (perhaps pulled out of the wash?) and lit by solar cells. Beneath the architectural features are steel plate girders supporting the deck and the roof. We previously discussed the Sixth Street Viaduct Replacement Project across the Los Angeles River which is currently being designed for Downtown LA.